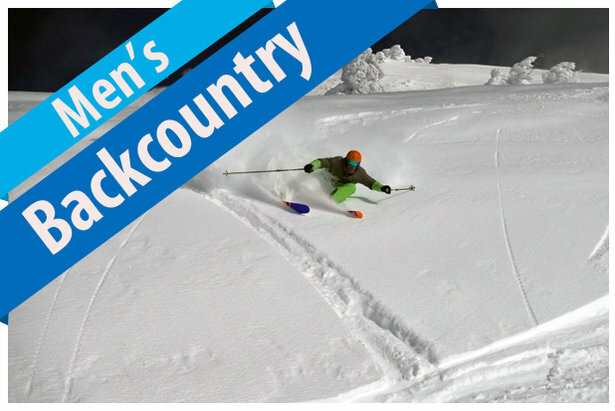 Men's Backcountry ski boot reviews for 2017/2018. While the men's Backcountry Category of ski boots is all about going uphill—they're the lightest of our test with the best touring range of motion and rockered, lugged soles—modern men's Backcountry boots ski well enough to handle themselves inbounds if that's where the day takes them, occasionally. Men's Backcountry ski boot shell and cuff construction is commonly comprised of polyamide plastics, like Grilamid and Pebax, and in combination with lightweight, fully thermo-moldable EVA foam liners (or the like), Backcountry ski boots are very light on the foot. Touring mode range of motion is generally longer than that found on Freeride ski boots, and a rockered, lugged sole and tech binding compatibility enhance the Backcountry boot's natural-feeling stride while touring and hiking. Men's Backcountry ski boots are not compatible with Alpine bindings—A.T. frame style or tech bindings are required here. The men’s Backcountry ski boot reviews are provided by our equipment experts at Bootfitters.com, powered by Masterfit. We asked around to some of the most knowledgable people in the industry to give you what you need to know when buying skis. Where Was The First Snowboard Invented?